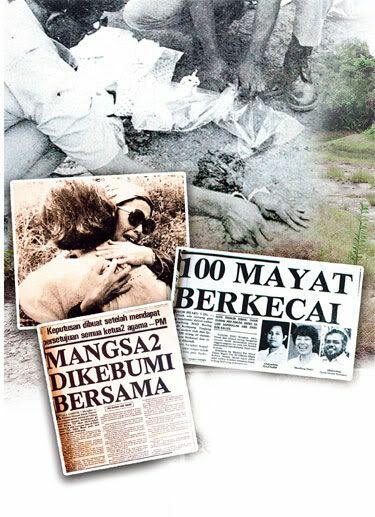 The date 4th December this year marked 33 years since the ghastly Malaysia’s worst air crash which took the life of 100 people. 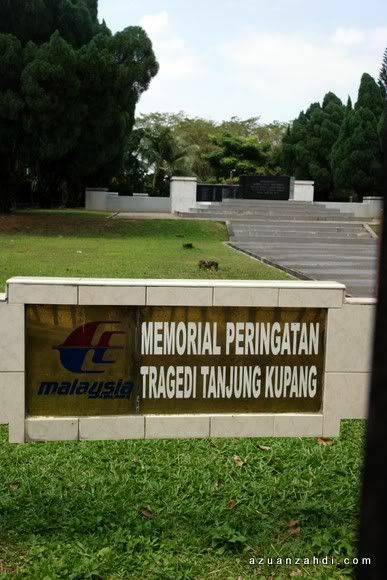 Tragedi Tanjung Kupang was the deadliest and first fatal accident for our national carrier, Malaysia Airlines. 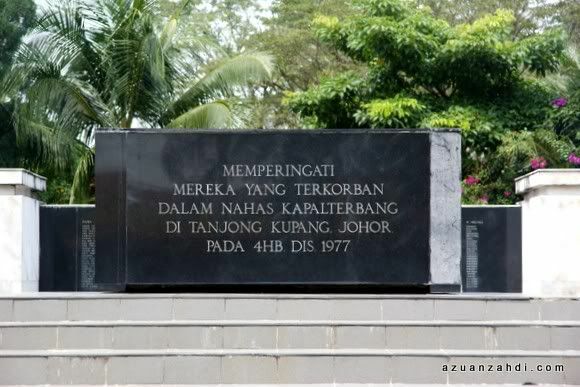 According to the wikipedia article, Malaysia Airlines Flight MH653, a Boeing 737-2H6 aircraft registered as 9M-MBD crashed at Tanjung Kupang, Johor, in Malaysia on the evening of 4 December 1977. All 93 passengers and 7 crew were killed instantly. The flight was apparently hijacked as soon as it reached cruise altitude. The circumstances in which the hijacking and subsequent crash occurred remain unsolved. Photo from a Kosmo news article last year shared here. For my blog readers that just got to know about this tragedy, here’s the Sequence of Events as captured in Wikipedia from various sources. Flight MH653 departed Penang’s Runway 22 at exactly 19:21 hours for Kuala Lumpur’s Subang Airport (now known as Sultan Abdul Aziz Shah Airport). [Passengers included the Malaysian Agricultural Minister, Dato’ Ali Haji Ahmad; Public Works Department Head, Dato’ Mahfuz Khalid; and Cuban Ambassador to Japan, Mario Garcia. The pilot in command was Captain G.K. Ganjoor. 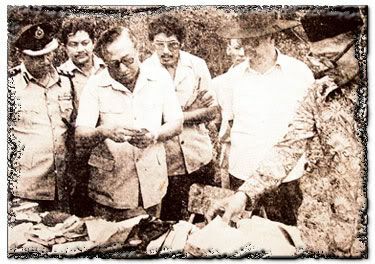 At approximately 19:54 hours, while at an altitude of 4,000 feet over Batu Arang and descending toward Subang’s Runway 33, captain G.K. Ganjoor reported an “unidentified hijacker” onboard to Subang Tower. The tower immediately notified the authorities, who made emergency preparations at the airport. A few minutes later, however, Captain Ganjoor radioed: “We’re now proceeding to Singapore…”. Flight MH653 never touched down at Singapore. At 20:15 hours, all communication with flight MH653 was lost. At 20:36 hours, the residents of Kampong Ladang, Tanjong Kupang in Johor reported hearing explosions and seeing burning wreckage in a swamp. The wreckage was later identified as Flight MH653. The plane hit the ground at a near-vertical angle at a very high speed. There were no survivors and not one recognizable body was found. Photos from a Kosmo news article last year shared here. 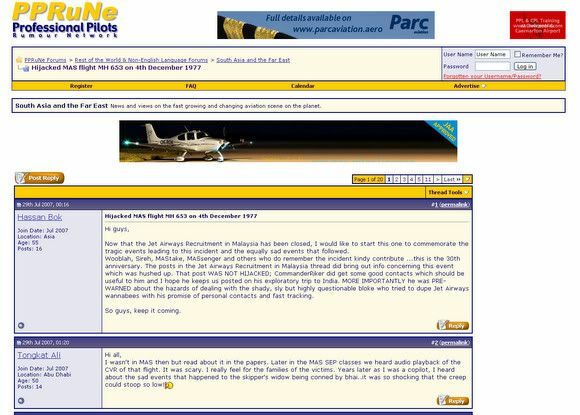 Also check out Profesionnal Pilot Rumours Network forum post on this tragedy here for a more comprehensive views on what had happened. 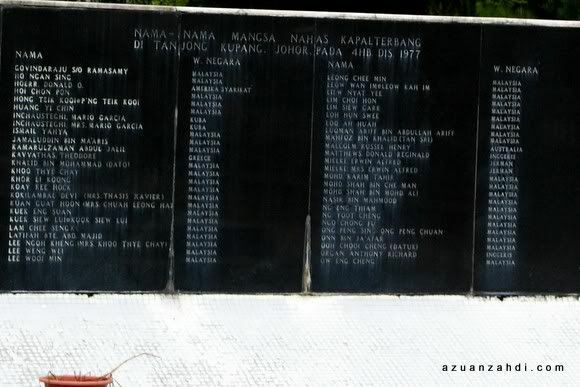 On my recent trip to JB, I stopped by at the Memorial Peringatan Tanjung Kupang. 33 years ago, this site was the scene of a very touching mass funeral that brings Malaysians together. A true 1Malaysia spirit with people coming from different races and religious coming together to mourn for the victims. Some photos that I took of the Memorial. iPad in Malaysia: My First Review! 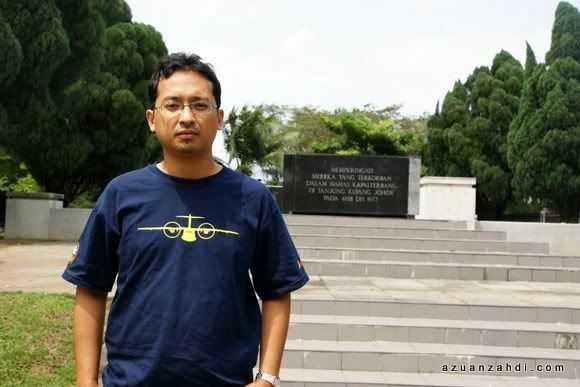 Al-Fatihah dan takziah. 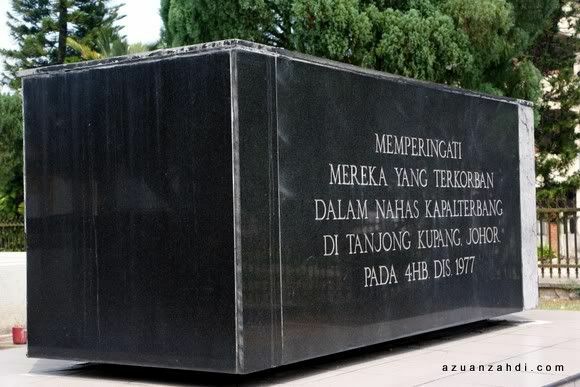 Tragedi 4 Disember yang terpahat sejarah hitam dalam dunia penerbangan negara dan masih meninggalkan 1001 misteri yang belum sempurna terjawab. 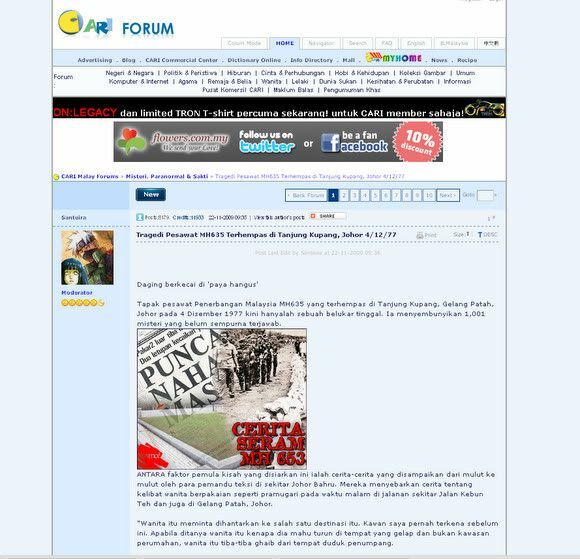 Gambar pesawat malang MAS 9M-MBD yang terlibat ada di entri blog saya berikut. I live across one of the crew member’s mum house in PJ and whenever I see Makcik outside of the house , I could not help but to notice her cheerful nature despite losing her son in the tragedy. Perhaps time really heals. This makes us recalled one of our best teacher at Catholic High School, PJ (Madam Khoo Thye Chai) who were died in this tragedy in 1977. A big big lost to CHS,PJ. I wish their children are doing well now. I wish them all the best, all of us will remember their mother ! Thanks for sharing this. This remind us mot tp take things for granted. This also show that the security at all airport at that time was lacking. However, things changed and there is a tremendous improvement of the security aspect at airports now. MAS did not neglected the memorial but they have to upgrade the up keeping. Consistent n frequent visits,to ensure good upkeep, by relevant authorities within MAS must be in place. Me too, seconded your idea/suggestion so that Nat Geo’s Air Crash Investigation seriously go deep into publishing a special documentary about this tragedy. MBD..that’s the registration of said aircraft..we always putting a joke while working at said shipside.. May,might be destroyed..(MBD)…may allah put in peace to all the victim..